Why do some homes have gutters and others not? What do gutters do? Are there different types of gutters? Read on to learn the pros and cons to determine if they’re beneficial for your home. Home gutters are long, narrow tubes used to reroute rain that falls on the roof of a home or building. The gutters funnel the water to the downspout on the ground where it’s directed away from the foundation of the home. This keeps the ground immediately around the house from becoming waterlogged and potentially leaking into the basement or causing other damage to the structure as well as surrounding landscaping. Without gutters, rain runs down the roofline creating a waterfall effect. If the roof has a wide overhang, this may not be too much of a problem for the foundation. But entering and leaving the home without getting wet can be more difficult especially during heavy rains. Because gutters are usually left open, they collect more than rainwater. Leaves, yard debris and insects get into gutters as well. 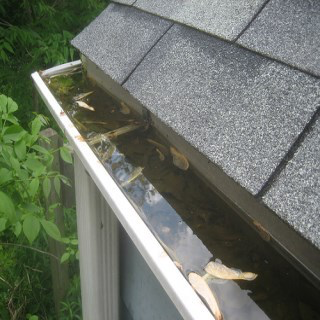 Debris hinders water flow, causing water to back up in the gutter and overflowing. Gutter screens can be added to prevent debris from accumulating. Gutters may also become damaged. Ice, tree limbs, animals and even heavy rains may dent gutters, weigh them down so they sag or cause them to pull away from the house. Consequently, gutters must be maintained regularly and cleaned once or twice a year, depending on your conditions. For instance, large trees near your home could result in more debris accumulating in the gutters. Spring and summer are the best times for maintenance. Use a garden hose to simulate rain and walk around the home to check for leaks or water that is not draining properly. While gutter maintenance can be a nuisance, fixing damaged gutters is not difficult or expensive. Holes can be patched and plugged with roofing cement. Sagging or loose gutters can usually be hammered back into place. If gutters are badly damaged, a single section can be replaced. Gutters cost as little as $2.50 per foot, depending on the material used and can be found at your local home center. Home gutters are most commonly made from vinyl, steel, aluminum or copper. Vinyl is light and strong, but it can become brittle in very cold weather making it more prone to damage from ice or hail. Vinyl gutters may last 10 years or more depending on the thickness and quality of the material. Steel is durable and holds a lot of weight, but it rusts where the finish wears off or becomes damaged. Depending on the coating used on the metal, steel gutters may last from 10 to 50 years. Aluminum does not rust, but it dents easily compared to other types of gutter material. Aluminum gutters may last 20 to 25 years on average. Copper gutters are beautiful and make a design statement besides their actual purpose, but expensive. With time, the copper develops a rich patina. Unfortunately, copper gutters can make homes a target for thieves because they are valuable and eye-catching. Choosing whether or not to install gutters, and if so, what type of gutters depends on your property, weather conditions, and budget. Weigh the pros and cons of home gutters too determine if they’re right for your home. The vision of brilliant fall foliage will soon abound signaling the change of seasons. As nature takes its course, trees exchange their vivid green leaves in favor of rich harvest hues. The cycle continues as leaves are shed from the trees, drift in the autumn wind and decorate the ground with beautiful colors. While we take in this autumnal splendor, it is hard to imagine the extensive damage that can be caused by something as delicate as a leaf. Leaves can clog gutters and downspouts resulting in severe problems and expensive home repairs. There are many gutter protection products on the market today that can drastically reduce this risk. Alcoa Home Exteriors, a leading manufacturer of building products, unveils its latest solution for gutter and downspout protection, Leaf Relief™. During the dry summer months, a leaf-clogged gutter could be a potential fire hazard as dried leaves are highly flammable. In damp warm temperatures, it can be a breeding ground for mosquitoes. According to public health officials, mosquitoes lay their eggs in the stagnant water of clogged gutters, which is a main concern in the outbreak of West Nile Virus. Recent reports have suggested that by keeping gutters and spouts clean and debris-free, homeowners can reduce their risk of contracting this disease. In the fall and springtime, leaves can get caught in a gutter, blocking downspouts and causing water to overflow. This can lead to leakage or even worse, a major home disaster. When water is trapped, it can seep under the shingles, though the fascia or into the soffit, where it can cause serious damage to exterior walls, insulation and drywall. Water damage can also cause roof deterioration and ground erosion, which can be particularly dangerous situation as this affects the foundation of the house. When winter begins to set in, the leaves, twigs and pine needles that remain in the gutter begin to decay and form a clay-like substance within the downspouts. During the day, snow melts and runs down the roof into the gutter where, trapped by this dam of debris, it can freeze overnight causing a serious obstruction. The weight of certain blockages can cause the gutter to pull away from the house if it is not securely attached and can cause pooling next to the foundation. Leaf Relief™ offers exceptional volume capacity, capable of draining 305 inches of water per hour - at least 25 times more flow than most competitors. Most ordinary dry debris is cleared from the surface with a gentle 6 mph breeze, while wet debris is removed with a 23 mph wind. 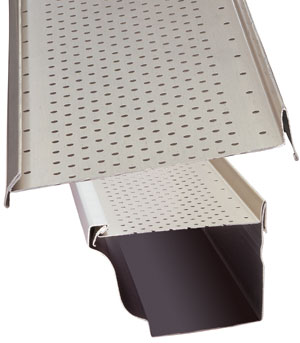 Virtually undetectable from the ground, Leaf Relief™ adds rigidity and durability to the gutter. The secure mounting system stays firmly in place to resist high winds, ice and snow, ladder damage and pest invasion.